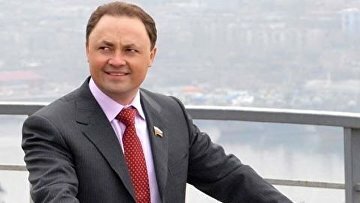 Vladivostok ex-mayor charged with bribery asks Putin for defense | Russian Legal Information Agency (RAPSI). MOSCOW, August 21 (RAPSI, Yevgeniya Sokolova) – Former Vladivostok mayor Igor Pushkarev charged with abuse of office and bribery has asked President Vladimir Putin to protect him “for the sake of justice,” as reported on his Vkontakte page. “You are guarantor of the Russian Constitution, that’s why I appeal to You not for loyalty and leniency, but for justice,” the statement reads. Investigators believe that between 2009 and 2016 Pushkarev «from mercenary or other personal motives» organized the acquisition by «Roads of Vladivostok» of a large volume of construction materials from the group of companies Vostokcement allegedly controlled by his relatives. Construction materials have been allegedly purchased at inflated prices. Pushkarev has received upwards of 75 million rubles ($700,000) for this. In total, Vostokcement received over 1.2 billion rubles ($20.3 million) for the delivered construction materials while Pushkarev’s relatives received dividends in the amount of more than 500 million rubles ($8.5 million), according to the Investigative Committee. Pushkerev has been removed from his post by court order.